a high-performance design that ensures reliable measurements and dependable operation. – ±20mA, 0-20mA, 4-20mA DC (selectable on each channel). 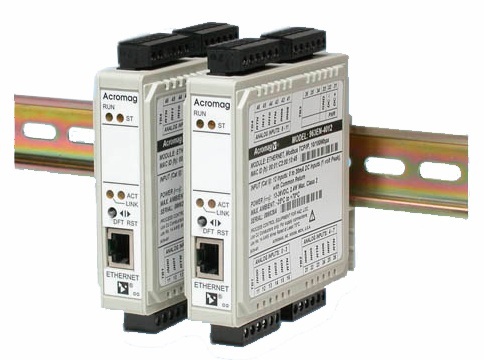 – Modbus TCP/IP, 10/100Base-T(X), i2o peer-to-peer. – 18 to 36V DC, 2.4W. – CE, UL/cUL (industrial-grade units only). – Zone 2, Class 1, Division 2, ABCD. – 967EN-4008: Less than 0.05% of range. – 967EN-4C08: Less than 0.10% of range. – 967EN-4008: -40 to 70°C (-40 to 158°F). – Relative humidity: 5 to 95%, non-condensing. – 3-way isolation of I/O, power, network circuits. – Peak: 1500V AC, ANSI/ISA-82.01-1988. – Continuous: 250V AC, 354V DC.